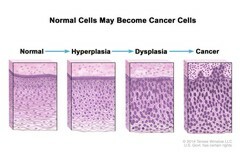 Drawing of four panels showing how normal cells may become cancer cells. The first panel shows normal cells. The second and third panels show abnormal cell changes called hyperplasia and dysplasia. The fourth panel shows cancer cells.